A hermit crab is a small crustacean in the phylum of arthropods, meaning that it has an external skeleton and jointed legs. With several hundred known species, hermit crabs live on land or water and are found from the tropics to the arctic. A few species are kept as companion animals and can make interesting pets, but they do require specific care and are not maintenance-free. 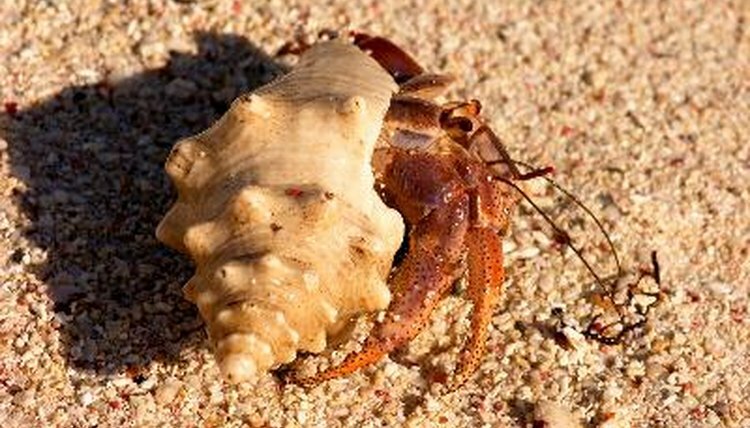 Hermit crabs are invertebrates, but they do have an exoskeleton, or outer shell, that provides support for their body. They have ten jointed legs, and usually the front two are of different sizes. The large left claw is used for defense, and the smaller right claw for scooping food and water. Two pairs of sensory antennae and two compound eyes at the end of stalks provide information about their surroundings. They breathe through modified gills. Because the hermit crab doesn’t have a very hard shell, and its abdomen is soft and vulnerable, it uses other animals' old shells for protection. Snail shells are common protection for hermit crabs. When it finds a proper shell, it pulls itself inside, leaving its head and several claws outside for locomotion, defense and feeding. The flexible body allows it to twist inside a variety of shells. When it outgrows its shell, seeks a larger one. Hermit crabs grow by shedding their exoskeletons and growing a new one, a process called molting. This happens about once a year, but smaller crabs might molt more often. You probably will see signs that your crab is ready to molt. His eyes will get cloudy, he will eat and drink more, and he will dig in the sand. Molting is stressful for your crab, and he feels safer hiding in the sand. Provide him with extra water, as well as foods high in calcium. Give him a couple of larger shells to choose from for his new home. Leave his old shell, though, as he might eat it for the nutrients. Hermit crabs are fun to watch as they go about the business of being crabs. These nocturnal creatures generally are quiet during the day, but come alive after sunset. Two are better than one – despite his name, this is a social creature. Tank mates will engage in play, climb over each other and try on other shells. Place similar-sized crabs together to avoid dominant behavior.